caterpillar fungus One of the most valuable commodities in Tibet is a caterpillar fungus, an expensive traditional medicine ingredient that is touted as a cure for a number of illnesses including SARS and AIDS and treatment for everything from impotence to aging. Among those that swear by it is the basketball player Yao Ming. Caterpillar fungus is a parasitic fungus that envelopes and kills the Himalayan bat moth caterpillar and feeds on it mummified body. Less disgusting than it sounds, it looks like a little yellow root with a stalk growing from the top. A single caterpillar fungus can be sold by peasants for about $3 and it in turns commands as much as $10 at a Chinese medicine shop. Chinese caterpillar fungus (Cordyceps sinensis) is often made into soup or cooked with chicken. Known as yartsa gunbu in Tibet and yarsagumba in Nepal, it is found in the high mountains and plateaus of Yunnan, Sichuan, and Tibet. It is considered a medicinal mushroom in Oriental medicines and is famous throughout the Himalayas. Tibet and Yunnan Province is famous for caterpillar fungus, pseudo-ginseng and gastrodia. Some villagers spend months at time searching the Qinghai mountains for caterpillar fungus, which is said to strengthen both lungs and sexual prowess and is sold in pharmacy and airport gifts ship for $200 an ounce. Yunnan White Medicine, a mixture of caterpillar fungus and over 100 herbs, is highly sought after. Espelie (1994) and X. Chen (1990) give the identity of the caterpillar as Hepialus armoricanus, which raises a question as to whether there is taxonomic synonymy involved or whether more than one species serves as host for the fungus. Cordyceps species appear to be host-specific, according to Steinkraus and Whitfield, but they note that this may only be apparent because more than half of the described species are known only from the original collection. Although the incredible performances of the Chinese women's track team cannot yet be attributed to the fungal potions, the authors conclude that, "Clearly, Cordyceps spp. deserve more [research] attention from pharmacologists, chemists, and entomologists." Unfortunately, Cordyceps has its greatest diversity in rainforests and becomes much less abundant as the rainforests are disturbed and destroyed. "The loss of these fascinating insect pathogens will be especially tragic because of their potential as a source of pharmacologically active compounds." “Yu Jian claims she can feel the worm’s effect—both physically and psychologically. She says it improves her spirits and revitalizes her “life energy”—what’s known in China as qi (pronounced chi). Her actual energy, though, can be variable. Though she’s quite thin, Yu does have a soft ruddy color and a palpable vigor. On better days, it’s easy to give the worms the credit. Other times, she’s reminded that all cures, ancient and modern alike, have their limits. Yet on her most recent medical visit, she recalls, her doctor was shocked by the swiftness of her improvement. “He didn’t even remember I was a cancer patient,” she says. “Until someone does a large clinical trial using a high-quality product, the science we have to rely on so far is not suggestive of a significant effect,” says Brent Bauer, director of the Complementary and Integrative Medicine Program at the Mayo Clinic in Minnesota, who has extensively studied herbal medicines. What’s more, says mycologist Paul Stamets, wild yartsa may be tainted by any number of unidentified fungal molds, some of which might be harmful. “People could be poisoned,” says Stamets, who has written six books on mushroom cultivation and sells his own mushroom products. “For the inexperienced, it is a form of Russian roulette.” Whether the worms are a potent elixir or an exorbitantly expensive myth, there’s little sign the yartsa gold rush will be over anytime soon. The evidence may be far from certain, but the belief is pervasive. The main center of the caterpillar fungus trade is in Qinghai Province, particularly in the Tibetan enclave of Golog, where fungus collecting is the main source of cash. During the fungus hunting season, schools close down so children can help in the search and people with jobs take time off with visions of making big money . The best fungus is found at higher elevations in places such as Heitushan, the 14,000-foot-high Black Earth Mountains in Golog. A mother assisted by her two daughters can earn $6,000 a season, triple what most Chinese families earn and enough for a peasant to build a new house. Locals clash with Han Chinese and Hui Muslims over the best places. Some road are roped off by police to keep outsiders from entering. Every year a few people are killed in turf battles. The caterpillar fungus season runs for about 40 days in the early spring when snowmelt turns the ground wet and spongy. Timing and vision are crucial. A sharp eye is needed to find the fungus that sticks up out of the earth among clumps of grass and earth. If you dig too early you get a live caterpillar. It is best to dug just after the fungus has killed the larvae. Silang and Yangjin approach a dealer they’ve worked with before, a man whose name is also Silang—Silang Yixi, 33, in business for eight years. He keeps photos of prized worms on his cell phone. The two Silangs conduct the ritual: the worm examination, the gibes—at one point the dealer returns the worms to the ramen bag and pretends he’s no longer interested—and eventually the haggling. In the end, for their 30 worms, most too small to command top price, Silang and Yangjin are paid 580 yuan, about $90. 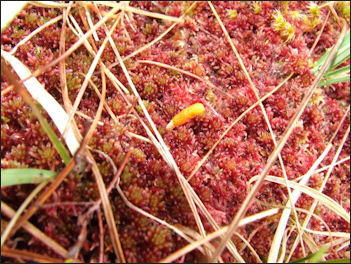 Caterpillar fungus is becoming scarcer as a result of over harvesting and changes in the Tibetan climate. One peasant told the Los Angeles Times, “When I was young, somebody could just walk out of the tent and dig 800 to 900 pieces in a day. Now we have to hike three hours up the mountains and the best we do is maybe 50 pieces. Even more of a threat to collectors is artificially-cultivated caterpillar fungus, which is already being raised in the United States and sold in China. Many feel that the bubble will burst and the price will fall dramatically when caterpillar fungus starts being cultivated extensively in Asia. The money made from collecting the fungus is a problem, A Tibetan educator and physician told the Los Angeles Times, “It’s not good for...building a harmonious society. People have become territorial. There are a lot of fights between family and friends and the possibility of corruption. Also a worry are environmental concerns like soil erosion and desertification caused by the excessive digging for the fungus. Yarsagumba is the term used in Nepal to describe caterpillar fungus. It also sometimes called Himalayan Viagra. Many poor villagers see “Himalayan Viagra” as a vital source of income. Foraging for the fungus is a major source of income for poor Himalayan communities. A kilo can fetch tens of thousands of dollars in China. The BBC says that although the caterpillar fungus has brought wealth to some regions, it has also brought jealousy and crime and many locals regard it as a curse.